In addition to this, I spent a couple of hours making the project compatible (and compilable) with Visual Studio 2015 in order to make it available for Windows platforms, too. In particular, the Windows version comes with ImageMagick 6.9.5 HDRI bundled in the same package. Since there are some important changes regarding its dependencies, here are some new instructions on how to build the source code on Linux. To compile Converseen you need Qt5, Magick++ development libraries, cmake and the gnu c++ compiler. Converseen is currently available on various official repositories of many important Linux distros like Ubuntu, Fedora, Arch Linux, OpenSuse, Mageia and so on. Please, check through your favorite package manager if Converseen is available. For more informations check this page. Installing Converseen on Windows is as easy as pie. Download the setup package from this page. It will install the Converseen executable including the latest version of ImageMagick. Notice: The Windows installation program doesn’t contain any 3rd party application or adware so, PayPal donations are very important! 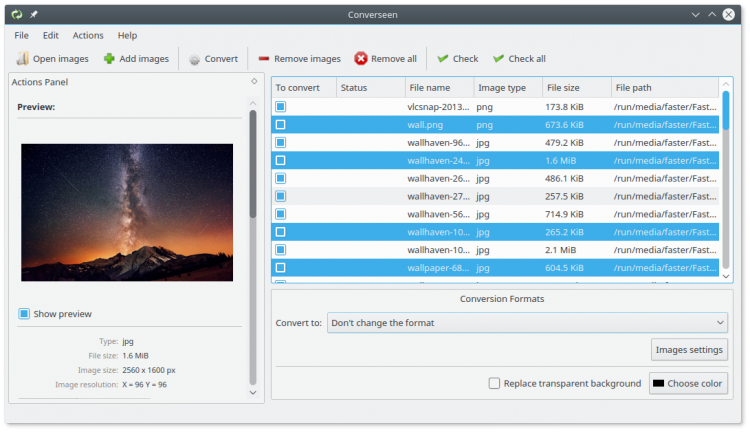 I have to say this version of Converseen is only a porting of the program to the latest and currently supported Qt libraries so It doesn’t include any new feature. New features will be included in Converseen 1.0 so, stay tuned for new updates.